Suzy Klein presents a selection of music and guests from the arts world, and is joined by tenor Gregory Kunde and pianist Louis Schwizgebel. 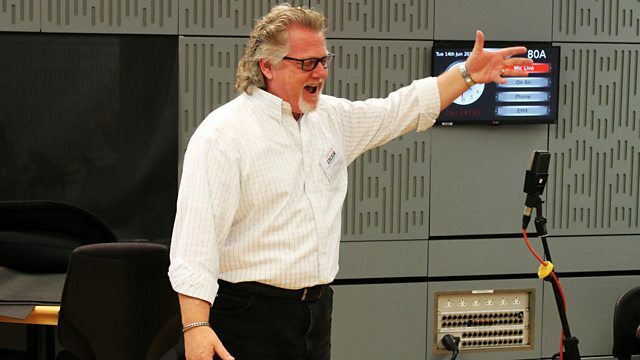 Neil Martin talks about his new opera. Suzy Klein presents a lively mix of music, chat and arts news, with live performance from tenor Gregory Kunde, who stars as Manrico in the Royal Opera House's new production of Il Trovatore early next month. Pianist Louis Schwizgebel plays live ahead of a concert at London's King's Place which explores Byron's extraordinary voyage to Switzerland. Plus composer Neil Martin joins us from Belfast to talk about his new opera for the city, Long Story Short: The Belfast Opera. Orchestra: New Zealand Symphony Orchestra. Conductor: James Judd. Elgar: Wand of Youth Suites No.1 & 2: New Zealand SO/Judd. Performer: Jan Vogler. Orchestra: La Folia Barockorchester. Director: Robin Peter Müller. Orchestra: Deutsche Kammerphilharmonie Bremen. Conductor: Paavo Järvi. Performer: Gregory Kunde. Performer: Roger Vignoles. Performer: Avi Avital. Orchestra: Venice Baroque Orchestra. Choir: Chorus of the Royal Opera House, Covent Garden. Orchestra: Orchestra of the Royal Opera House, Covent Garden. Conductor: Bernard Haitink. Music Arranger: Jonathan Morton. Ensemble: Scottish Ensemble. Director: Jonathan Morton. Debussy & Takemitsu for Strings. Choir: The Cambridge Singers. Ensemble: Nuova Musica. Conductor: John Rutter. Performer: Lang Lang. Orchestra: Vienna Philharmonic. Conductor: Harnoncourt. Conductor: Nikolaus. Performer: Xuefei Yang. Music Arranger: Yang. Music Arranger: Yang. Librettist: Alan Jay Lerner. Ensemble: Original Cast. My Fair Lady: Original London Cast Recording. Performer: The Dave Brubeck Quartet.